“We, the leaders of the Arab countries gathered in Tunisia ... express our rejection and condemnation of the United States decision to recognize Israel’s sovereignty over the Golan,” said Arab League Secretary General Ahmed Aboul Gheit. 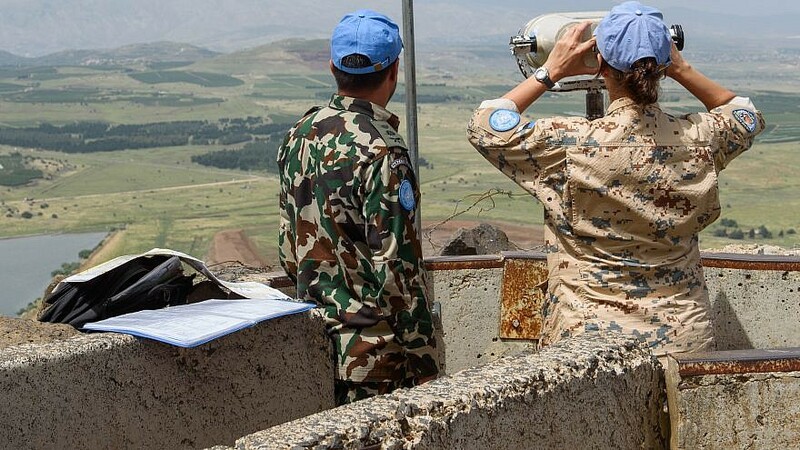 U.N. observers posted on Mount Bental overlooking the border with Syria in the Golan Heights in northern Israel on May 10, 2018. Photo by Basel Awidat/Flash90. (April 1, 2019 / JNS) Arab leaders on Sunday called for a U.N. Security Council resolution condemning the U.S. decision last week to recognize Israeli sovereignty over the Golan Heights. “We, the leaders of the Arab countries gathered in Tunisia … express our rejection and condemnation of the United States decision to recognize Israel’s sovereignty over the Golan,” said Arab League Secretary General Ahmed Aboul Gheit. In addition to presenting a resolution, Gheit added that the countries would seek a legal opinion from the International Court of Justice. The Arab League leaders also urged cooperation with Iran and called for a two-state solution to the Israeli-Palestinian conflict.